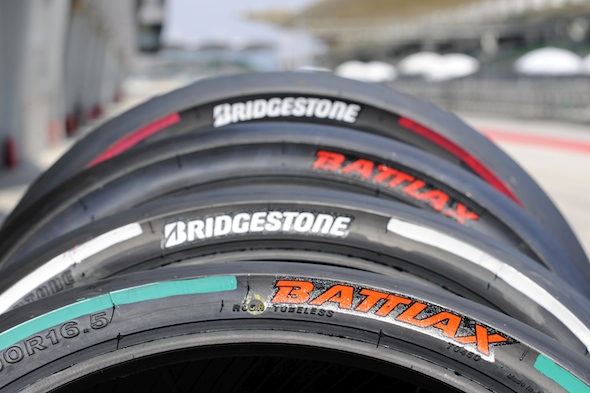 Taking inspiration from F1 (maybe), MotoGP will now adopt a colour marking system on the Bridgestone slicks. With all the different tyre options available to Factory and Open class riders, it’ll now be easier to ascertain which rider has what rubber. Hiroshi Yamada – Manager, Bridgestone Motorsport Department – “The new tyre marking scheme is designed to make it easier for fans to see which tyre compound each rider is using on the front and rear of the bike. Before last year when the whole grid was on the same tyre compounds, our old marking system worked perfectly. Since the introduction of the CRT class, and now the grid being split between the Factory and Open-class machines, we’ve decided to change the marking system to suit. Last year, when our marking system used the white stripe to denote the softer option for each class, the audience needed to know if a rider was a Factory or CRT bike to know which compound was being used.